In-App SDK is an all-in-one-tool for App Distribution, Visual Feedback submission ,Crash Reporting and Analytics For Mobile. Tell me, How do I get started? To get started, visit appOwiz and create an account. Once you are registered with appOwiz you can invite your team members and build your team. After building your team, download the In-App SDK and integrate it with your apps and start submitting visual feedback, crash reporting and Analytics from your apps. Step-by-step instructions have been provided in SDK manual section for fore details. How In-App SDK works ? To see how In-App SDK works; please: click here. Ok, I get it. But tell me what is the actual role of In-App SDK on my device? You can use In-App SDK to submit visual feedback, crash reports and Analytical data. Download the In-App SDK SDK and integrate with your apps. I am not sure, will it support my mobile device? In-App SDK is not only available for iOS and Android platforms but it is also available for windows phone platform which is gaining momentum in the market. By following simple steps you can integrate In-App SDK in your app and app user can start submitting bug reports and feedback. How In-App SDK is different from other bug reporting tool in the market? In-App SDK is not only limited to bug reporting tool but, we also support crash reports submission, App Distribution, Submit Feedback in different ways like audio, video and image. In-App SDK also collects analytical information from devices. Is this a replacement for the Apple App Store or Google Play Store ? No. In-App SDK is not a replacement for Apple App Store or Google Play Store. 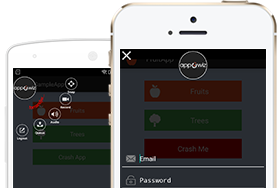 In-App SDK is all-in-one-tool for App Distribution, Visual Feedback submission, Crash Reporting and Analytic For Mobile devices. Do I need to share my Apple Developer / Google Play Store login details with you? No, we do not and we never will require your Apple Developer / Google Play Store login details. I am interested, tell me more about how the Crash Reporting works? When app crashes, In-App SDK collects the root level crash log details and submit them to your In-App SDK account. You can see all crashes for your apps in the “Issue” section. Is there any way if I want to add my team members or testers to my app? Yes. In order to add team members or testers click on “Team” from your In-App SDK account which you generated earlier. Is there a cap for the number of testers or users? Yes, For more details please visit us our pricing section. What is UDID and how can I find it ? Each iPhone / iPod has a Unique Device Identifier (UDID). They are 40 character long alpha-numeric values. Only registered apple device can run apps (non App-Store-vetted). So mostly UDID is used by developers to register their apple device for testing apps. UDID looks like 9c3d9dc472d141be2e1478225d5664045b834985. To get your UDID,open “Tap To Get UDID” from your iPhone/iPod. I still have questions. Whom should I contact? For any questions you can contact us.